1879 4d Sage Green, SG 153, Plate 16, tied to envelope addressed to "St KITTS, WEST INDIES" by a London Gracechurch St Late Fee 'L1' duplex. Small fault on front of envelope, lower left, but still attractive. 1848 Envelope addressed to "THE HONBLE A. A. COCHRANE, H.M.S. WELLESLEY, N. AMERICA & W. INDIES STATION, BERMUDA" from DOLGELLAU - HMS Wellesley details are enclosed. Ex Osborn. 1838 Estate entire from Berbice addressed to Inverness showing a DEAL/SHIP LETTER, Robs S8. Interesting content which mentions "...THE NEGROES REFUSED TO WORK FOR THE WAGES NAMED IN MY LAST..." etc. "...THE GOVENOR ALONE MADE THEM FREE AND MUST FIX THE RATE...". 1859 6d Lilac, SG 70, tied to cover to London by a fine GRENADA 'A15' NUMERAL CANCELLATION. 1846 Entire to London showing a very fine FALMOUTH JAMAICA cds on the front, Type P4, and a MS 1/2. Uncommon. 1835 Oct 3rd Entire from Buenos Aires to London showing a step-framed YARMOUTH/SHIP LETTER, Robs S 4. Robertson recorded eight examples of this type and a further three have been found since in a bank archive. More details are included. 1803 Entire from New York to Glasgow showing a fine oval-framed SHIP LRE/♔/GREEENOCK, Robs S5, in Red. 1823 8TH APRIL ENTIRE HEADED "ST JOHN'S ANTIGUA" addressed to Edinburgh showing a very fine step-framed PORT.GLASGOW/SHIP LETTER, Robs S5. Interesting content re his journey from the Downs to Antigua which took 6 weeks and 1 day. MS 1/4½. 1886 4d Dull Green, SG 194, tied to envelope from Newbury and addressed to COQUIMBO, CHILE "VIA LISBON TO OVERTAKE THE MAIL" addressed to "Capt Brackenbury R.N, CMG, HMS "Hyacinth". Ex Geoffrey Osborne. Further explanation included. 1828 Entire from Buenos Ayres "P.Packet" to London showing a VERY FINE "1" OZ AT 14S/- per Oz", and showing manuscript"14/-", L 1035j. Very Scarce. 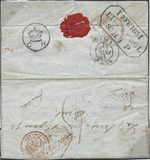 1826 Cover from Philadelphia to Liverpool showing a very fine Boxed SHIP LETTER/LIVERPOOL, Robs S 12 on the reverse. 1866 Entire (Prices Current) from Liverpool to New Orleans "Pr Scotia via Queenstown" showing a superb LIVERPOOL/P.L.O. Packet Letter cds, Robs B 26. 1839 Entire from New York to London "Pr Gt WESTERN" showing a very fine BRISTOL/SHIP LETTER, Robs S8. 1809 Entire from New York to London "By the Pacifick" showing a fine oval-framed "SHIP - LETTER/♔/FALMOUTH" in black, Robs S 4. 1824 Entire WRITTEN ON BOARD H.M.S. SPARTIATE at Rio de Janeiro, addressed to Ross, N. Britain. Sent by the 'Lord Melville Packet' and showing a very fine 'BRAZIL/MA21/1824/F' of FALMOUTH in GREEN, Robs FP2. 1823 Entire from Jamaica "P. Pkt" to Glasgow, charged '4/10' and showing a SUPERB FALMOUTH '½' IN GREEN. 1801 Cover addressed to Greenock "Per Darlington" showing a SUPERB OVAL-FRAMED Ship Letter/♔/QUEBEC, and a very fine OVAL . Ship Letter ./♔/LIVERPOOL, both in black, Robs S4. 1877 2½d ROSY MAUVE, SG 141, PLATE 9, BLOCK OF FOUR, G-E/H-F, tied to entire from Liverpool to New York "Pr City of Berlin" via Queenstown". 1793 Cover from MONTEGO BAY JAMAICA addressed to Edinburgh showing a very fine BRISTOL/SHIP LRE, Robs S 1. 1935 Envelope from Canada to USA via England endorsed "Posted at Sea Aboard" with a 'S. S. DAKOTIAN/145910/LIVERPOOL/4064' cachet. The Canadian stamp is cancelled 'AVONMOUTH/BRISTOL'with, alongside, "SHIP LETTER/AVONMOUTH/BRISTOL", Robs S1. 1838 Entire from New York to London SENT BY THE "GREAT WESTERN" and showing a fine step-framed BRISTOL/SHIP-LETTER, Robs S 7. 1883 4d Grey-Brown, SG 160, Plate 18, Pair, tied to entire to Venezuela sent "Pr French Str via Bordeaux" together with a ½d DEEP GREEN, SG 164, PAYING LATE FEE by fine Manchester duplex. 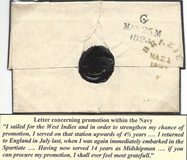 1831 Cover from Jamaica to Glasgow "P. Ship Eliza Capt. 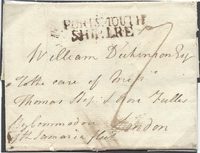 J Cameron" showing a very fine GREENOCK/SHIP LETTER, Robs S12. 1860 1d Rose-Red, SG 40, Plate 27, lettered M-J/M-L and N-J/N-L - M-K and N-K with GOTHICK 'K'. Two strips of three tied to envelope to Halifax, Nova Scotia by fine TAUNTON '776' duplex. 1875 Envelope from Ballindalloch addressed to Canada showing a very fine INSUFFICIENTLY/PREPAID in black. 1838 Cover from Havana? to London via New York with manuscript "Recd & Forwarded by Spofford & Tileston & Co" (New York) on the reverse together with a LIVERPOOL/SHIP LETTER. Showing a Liverpool Segmented Circle Inspector's mark on the front. 1882 2½d Blue, SG 157, Plate 22, tied to neat envelope to New York by a very fine CAMBRIDGE 158 duplex. 1834 Entire from New York to London showing a very fine boxed GRAVESEND/SHIP LETTER, Robs S 9. 1907 Postcard from Barbados to South Farnboro' showing a very fine SOUTHAMPTON/SHIP-LETTER cds, Robs S 14. 1836 Cover from Rio to London per "Meanwells/London" showing a very fine ROMNEY/SHIP LETTER, Robs S 3, in black, with MS '2/10' - Double Inland 1/6 + Sea 1/4. 1903 Post Card to USA franked by an Edward VII 1d Scarlet, SG 219 , tied by a very fine CALEDONIAN T.P.O./DAY-UP cds. 1876 1d Rose-Reds, SG 43, Plate 176 and a ½d, SG 48, Plate 13, tied to envelope from TAUNTON to ONTARIO, CANADA. 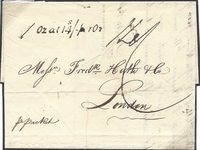 1800 Cover from Jamaica to London "Pr The Lady Perrington" - file note mentions Slaves bought in "Martinico" - showing a fine, for this, two-line DUBLIN/SHIP LETTER, Robs S2. VERY SCARCE. 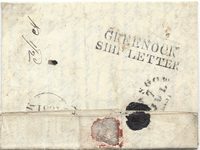 1869 1/- Green, SG 117, Plate 4, tied to cover from Manchester to Tampico, Mexico, sent "Pr French Packet", St Nazaire Packet. 1779 ENTIRE FROM ANTIGUA addressed to London "Pr Capt. Stark" showing a very fine FALMOUTH/SHIP LRE, Robs S 1, written by Samuel Athill to Sir William Codrington reporting the death of his father. 1879 2/- MILKY BLUE, SG 120b, Spec J118(5). A very fine example tied to Entire to Venezuela sent "per R.M.S. 'Nile" and cancelled by a very fine MANCHESTER '498' duplex. A VERY SCARCE SHADE, ESPECIALLY ON COVER. RPS Certficate 2017. 1841 Entire from New York to London "P South America" showing a very fine LIVERPOOL/SHIP LETTER, Robs S14. 1825 Entire from YORK, Pens via OGDENSBURGH, NEW YORK to Edinburgh showing a very fine LIVERPOOL/SHIP LETTER, Robs S9. 1808 Cover from Quebec to Guernsey via London sent "P the Jane/Capt Scott" showing a very fine SHIP LETTER/♔/JAN 11 1808/LONDON, Robs S17. Ex Alan Robertson Collection.